Molly, or Margaret Mary Vere Neilson, to give her her full name, was born in Kettering, England, on 30 July 1896, the daughter of a bank manager. During World War I she started training as a nurse and then transferred to become an ambulance driver and finally an instructor of ambulance drivers. 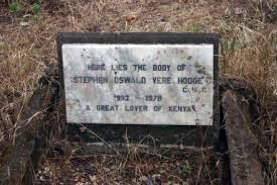 A year after the war ended, in 1919, she met Stephen Hodge, on leave from Kenya after being seconded to the army in East Africa as an intelligence officer during the war. They got married that year and Molly followed her husband to Kenya, travelling on the Garth Castle. Stephen met her in Mombasa and they took the train to Gilgil. One of Molly’s first impressions of Kenya was surprise at seeing a hen sitting on its eggs near the head of Lady Colvile’s bed at Gilgil. Stephen was posted as DC in Rumuruti, whither the pair travelled on mules. The Hodges spent ten days on the journey from Gilgil to Rumuruti, cutting down trees to cross streams on the way. As they arrived at their house, Somalis and their goats bustled out of it to make way for the new owner and his wife. Because of the difficulty of transport and roads in those years (1920-21), they never moved out of the area for the whole duration of their two-year posting. They had been wise to come to Rumuruti well stocked up with necessities, and all they purchased locally was paraffin, sugar, soap and flour. Stephen (always known as ‘Hoaj’) was pre-occupied with the Soldier-Settler scheme concocted by the Government after World War I. Some of those who arrived on the scheme knew nothing about farming and even expected to have a house waiting for them on land they had been allocated. Molly followed her husband around the country on his various postings, which included Kericho, Kakamega, Kisii, Kisumu and Nakuru. During his stint at Kisii he was keen to develop the district and would frequently include suggestions to others about taking up blocks in trading centres and building houses for the Africans who were employed by the government. While there the Hodges bought a 30-acre plot of land at Subukia and built a house. Stephen was promoted to be PC at Nakuru, where Molly started growing coffee seedlings for sale to neighbouring farmers. Some neighbouring land came up for sale in Nakuru and with a bank loan they were able to purchase it. There Molly started to grow pyrethrum and began a small dairy farm, all the time having to provide entertainment for the many visitors to the PC’s house. During World War II Stephen was posted to Mombasa and Molly found herself providing entertainment for all the Royal Navy officers who ended up at her house. The Hodges returned to their farm in 1946, when Stephen retired, and it was at this time that Molly began to take an interest in horse racing. In due course she became a well-known racehorse breeder, trainer and owner, and was considerably successful on the racetrack. Molly had a very liberal attitude and was keen to tend the sick among her farm labourers and their families. She also built her workers a cooperative shop and helped them run it. She was a keen supporter of the East African Women’s League and was at one time its vice-president. She and her husband were churchgoers and gave the land for, and contributed to, the building of St Peter’s Church, Subukia. Despite this, after Stephen’s death in 1979, Molly was twice attacked in her own home and was forced to move to Harrison House in Nairobi in 1984. She died in Nairobi in 1995, leaving three sons. Some of this information is from Peter’s Ayre’s East Africa Biographical Database, which we hope to publish on the web in due course.